HANOVER, NH (July 13, 2018) - Matt Paradis (Concord Country Club) has made three-straight visits to the final match of the New Hampshire Amateur Championship presented by Audi of Nashua. This is the first year he has claimed the title; he defeated the top seed, Pat Pelletier (Carter CC), 6 & 5 in the 36-hole final held at Hanover Country Club. For Matt Paradis, he has faced numerous tough competitors in the State Amateur, including 2016 and 2017 champions, Chris Houston and Mike Martel. This year he wasn’t leaving anything on the table as he fought hard to get back to the match that very few have advanced to. This was very clear in the first 18 holes of play as he was four under on the front nine and two under on the back nine, going bogey free. Paradis won six of the first ten holes of the match getting himself to 6up by not losing any holes in that stretch. One of the highlights was an eagle on the par-4, third hole after driving the green and draining his putt. By the time the first 18 holes were done, Paradis had a comfortable 7up lead on Pelletier. Pelletier was going to need to make a run early in the second half of the match to have a chance. Despite an eagle on the third hole the first time around, Paradis pulled his drive out of bounds the second time around and ended up making a six. Seeing that Paradis was likely out of bounds off the tee, Pelletier played it safe, keeping it in play and was conceded his birdie after Paradis couldn’t get up and down. At that point, Paradis was still 6up. Pelletier bogeyed the 8th hole the first time around and did it again the second time around giving Paradis his 7up lead back. The two made pars on 9, 10, and 11 in the second half. On the par-3, 12th hole Paradis put himself in a tough position, missing the green right. His chip up fell on the fringe and he failed to make his par putt. Pelletier cozied his putt up and made par to get one back. At this point, Paradis was dormie; Pelletier needed to keep winning to extend the match but matching pars on their 31st hole of play ended it with Paradis victorious, 6 & 5. It has been a few years since Pelletier has played in the New Hampshire Amateur, but with his familiarity with Hanover Country Club, he knew he had a shot at the title this year. While he put up a good run the entire week, earning medalist honors and cruising through his matches, he came up short in the final match. Competition will be held at ten pre-qualifying sites and will be 18 holes at Stroke Play. The low qualifiers and ties from all the sites along with the players exempt from prequalifying, will be eligible for the 36-hole qualifying on the first two days of the tournament proper. Sixty-four players will begin match play the following day. 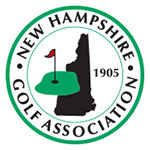 Entries are open to males who are members in good standing of member NHGA Clubs who are legal residents of New Hampshire. An eligible non-resident can play in NHGA Championships if he has been a member in good standing of an NHGA member club for the last three complete golf seasons and has played a minimum of 25 rounds of golf at this club in each of the three seasons. A letter signed by the President of the member club must accompany his first entry, stating that the player complies with NHGA eligibility requirements.